In 1996 when Tim and Diane Mueller were interested in developing Jackson Gore, they cited several reasons for expanding Okemo Mountain Resort. They recognized the need for a first-class full-service hotel, a village with amenities, and more summer activities and attractions “to keep Okemo current with ski industry trends,” they noted. Now almost 20 years later, those plans — which met years of delays to the actual debut of the Jackson Gore Inn — are reaping benefits. Additional investment in a village and amenities including the more recent summer events, festivals, attractions, and activities have added even more to the summer tourism draw. With developing summer business currently a “hot trend” among mountain resorts nationwide, The Mountain Times asked Okemo Mountain Resort’s Marketing Director Dave Kulis to comment on various aspects of summer business and how it is working out for the resort. Mountain Times: Is the summer audience different from the one interested in winter? Dave Kulis: To a significant degree, the summer audience is different. Given that we have a high amount of second homes on the mountain, we have a core group of loyalists that visit us in both winter and summer. The same can be said for the local population in and around Ludlow. However, the major difference is that our summer offerings appeal to a wider audience in that they do not have to be skiers or snowboarders to enjoy what we are doing. With skiing and snowboarding, the significant “barrier to entry” is defined by the learning process and the equipment one needs to enjoy those sports. In essence, you have to learn to ski or snowboard. In summer, the Adventure Zone has a bigger market appeal because we offer thrills that one can enjoy regardless of skill level. Our summer golf business would be most similar to that of skiing and snowboarding in that regard [skill levels] although the two don’t have complete crossover — some, but not all, golfers are skiers and vice versa. MT: Golf, fitness center, tennis, kids’ summer camp, festivals, and weekly concerts were already at Okemo by 2010. 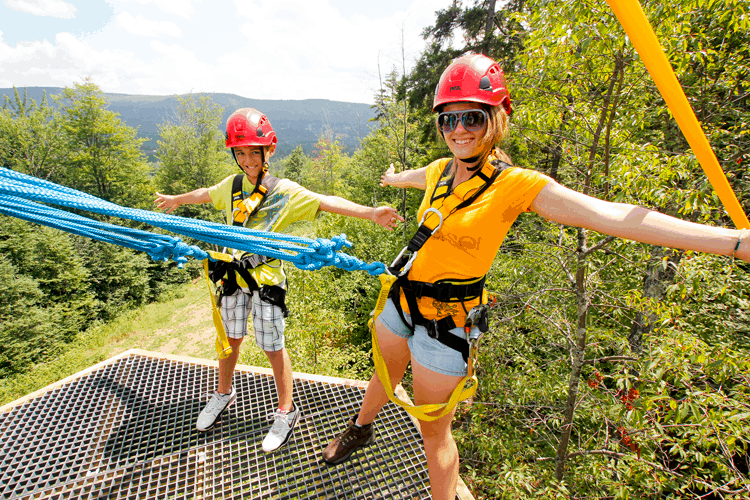 Did Okemo expand those existing summer offerings to appeal to a broader market? DK: Yes, we definitely wanted to appeal to a broader market, but we also knew that it was likely that our “early adopters” of our summer products would be winter Okemo loyalists and that it would take additional time and marketing to reach a wider audience that wasn’t familiar with Okemo by way of winter visitation. The Timber Ripper [mountain coaster installed in 2010] is a great example of finding an attraction with great appeal in multiple seasons. It doesn’t often happen that you can find something that works as an outdoor attraction in both winter and summer, but the mountain coaster fits the bill. It makes the investment in such an attraction a lot easier to justify when you have two seasons of potential guest revenue and enjoyment that you can factor in when deciding whether the addition makes sense. The ROI [return] on such an investment is a lot quicker. MT: Can you address how the new initiatives have worked out for Okemo in terms of summer visitation since the installation of the Timber Ripper (and all the additions like miniature golf, disc golf, bungee jump, challenge course, zipline, climbing wall, airbag, Segway tours) since then? DK: Summer visits have grown as we added more activities, events, and festivals. We’ve seen significant revenue growth in our culinary operations and more stays in our hotel and lodging properties as a result of all these summer additions. Summer of 2013 set a new high point for summer revenues across these areas, and we look to be on pace to have another record-breaking summer for 2014. While we’ve been in the wedding market for quite some time, the wedding business has shown growth also, and we are looking at ways to enhance our capacity in this area. MT: Was the addition of the Toll Gate Garden another effort to expand the market appeal or simply to accommodate more weddings/special events? DK: The addition of the Garden was an effort to provide a beautiful, unique and memorable venue for weddings that really fits into the Vermont motif. It also addressed the need of our expanding summer business. As we added the Adventure Zone, we realized that we needed to have separate wedding ceremony venues to provide the peaceful setting that a wedding party would expect. So while we previously used the courtyard adjacent to the Adventure Zone for weddings and other special events, we needed to be able to operate the high-energy adventure zone concurrent with those events. The Garden provides that special venue at Jackson Gore. (We also have other event venues around the resort.) We are in the planning stages to offer additional wedding venues in the future. MT: Can you summarize how summer business has impacted Okemo overall? DK: Certainly a goal was to increase year-round business and to make this business a bigger percentage of Okemo’s overall annual revenues. We have definitely moved the needle in a positive direction. As we continue to grow summer, not only do we remove some of the seasonal risk of having a “winter only” operation, but we are also able to employ more full-time year-round staff, and cross train that staff to work different positions from summer to winter. This has a great benefit in terms of employee retention — we keep excellent employees that we might have otherwise lost in the past due the seasonal nature of some positions. MT: Is there room for continued growth? DK: We definitely see room for continued summer growth. The pace of growth hasn’t shown signs of leveling off, and we will continue to look at our facilities and amenities to enhance our offerings for spring, summer and fall — all while understanding that winter continues to play a very important role at Okemo and that it always will. MT: Have Ludlow businesses benefited from your summer growth? DK: Anecdotally, as someone who has recently returned to Ludlow after being away for a decade, my impression is that Ludlow is a much more vibrant town in summer than it was during my last residency in Vermont. There are more options and the foot and vehicular traffic in town appear to be up significantly over time. Undoubtedly, Okemo plays a role in this through our golf, hotel and culinary operations, coupled with special events, festivals and weddings. In addition to agreeing with Kulis’ observations, she stated that Vermont Tax Department Rooms and Meals and Retail tax reports show “we are up year over year,” noting Chamber members are located in seven towns and three counties. Graf also stated that the impact of Okemo can be seen through its attracting events like the Iron Adventure Run, a three-day motorcycle enthusiasts’ event. “They ride all over the state and are based out of Jackson Gore, but rooms in Ludlow also sell out and restaurants benefit, too,” Graf said, explaining that she worked cooperatively with Okemo personnel to bring the event to the area last year and that it returns this July 24-26. Such events “introduce new people to the region, and they come back because they like our region,” Graf added, noting the impacts extend far beyond the events themselves.